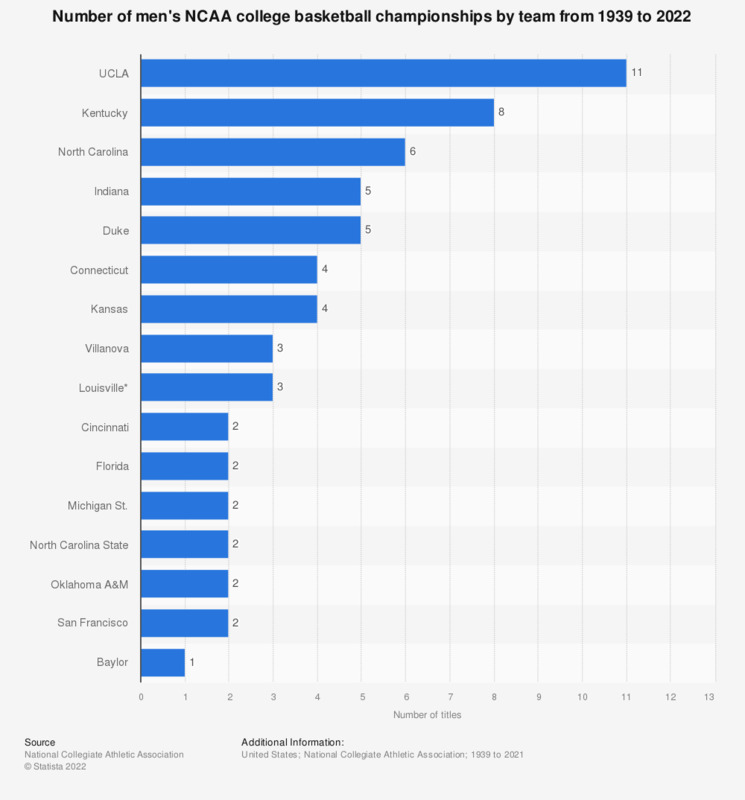 The statistic shows the men's college basketball teams with the most NCAA Division I championships from 1939 to 2018. UCLA has won the championship a record eleven times. NCAA Men’s Division I Basketball tournament, also known as “March Madness”, is the most important competition for collegiate basketball, which is the second most followed college sport in the U.S. In a single-elimination format, 68 college basketball teams fill out the bracket and play for the championship title. There are several rounds of the tournament; first round, also known as “Round of 64”, the second round or the “Round of 32”, regional semi-finals, called "Sweet Sixteen", the regional finals, commonly known as the "Elite Eight", national Semi-finals, referred to as the "Final Four" and lastly, the championship game. In 2016, the NCAA March Madness average TV viewership consistently increased as the tournament unfolded. Round of 64, for example, had an average audience of 2 million viewers per game, while Final Four games’ average viewership was at almost 11 million viewers per game. The North Carolina Tar Heels have the most Final Four appearances with 20. The Tar Heels hold six championship titles putting them in the top three teams who have the championship the most. UCLA leads the rank in regards to championships as the Bruins have won a record 11 championships. The Kentucky Wildcats have the second most championships, a total of 8 titles. Both UCLA and Kentucky have made it to Final Four 17 times. Even though the Michigan Wolverines men's basketball team has only won two men's NCAA college basketball championships and appeared in a total of nine Final Four rounds, they have played in four of the top 10 highest-rated televised NCAA basketball national championship games. The highest-rated game ever was the national championship game matchup between the Wolverines and Indiana State Hoosiers in 1979, with a rating of 24.1.